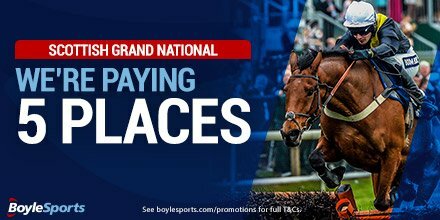 A stellar field will go for glory at Ayr on April 16 for the Scottish Grand National, the final of the UK Nationals, run over a trip of 4m and with a top-prize of £120,000 on offer for the winner! 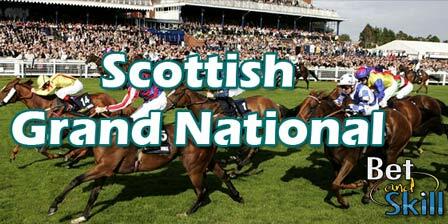 Find here our Scottish Grand National betting preview with tips, predictions, trends, odds, free bets and no deposit bonuses! HEATHFIELD, third behind Cheltenham Festival winner Empire Of Dirt two starts ago, was last seen winning over hurdles at Navan. He underlined his staying credentials when landing a 3m6f contest at Punchestown in May and he is very lightly-weighted. CAUSE OF CAUSES was a 12-length winner of the Kim Muir Challenge Cup at last month's Cheltenham Festival, but he was unable to make it into last week's Aintree Grand National field. He could have plenty of weight though, but it wouldn’t be a huge surprise to see him in the mix over this longer distance. MEASUREOFMYDREAMS , an impressive Grade 2 winner of the Ten Up Novice Chase at Navan in February, put up a bold show when third in the four-mile National Hunt Chase at the Cheltenham Festival. He looks sure to go well as Mullins bids to put the seal on the Trainer’s Championship. FOLSOM BLUE was fourth to stablemate Rogue Angel in the Irish National at Fairyhouse and bids for glory in this just a week after Rule The World won the Crabbie's Grand National for the stable at Aintree. SEEYOUATMIDNIGHT was also last seen at Cheltenham, but failed to uphold the form of his victory over Blaklion in January and ultimately finished a well-beaten seventh behind that rival in the RSA. GOLDEN CHIEFTAIN took the Somerset National in good style, beating Dawson City a shade cosily; and he looked set to score another comfortable success at Exeter before falling three from home when in command over the only horse to eventually finish in that race, Midnight Prayer. A GOOD SKIN has been a model of consistency this term, and was last seen chasing home Cause Of Causes at the Cheltenham Festival while HIGHLAND LODGE, who failed to make into the Grand National field last week, was a winner of the Becher Chase at Aintree on his last start. ROYALE KNIGHT, sixth in the 2015 Grand National at Aintree, was last seen finishing fifth at Ascot in mid-February. He won the 29f Durham National at Sedgefield in October and ran creditably back over hurdles both starts since. VICENTE is a three-time winner over fences this season and a good fifth behind Measureofmydreams in the NH Chase at Cheltenham last monthm 15l behind Minella Rocco. His jumping isn't foot-perfect. BALLYCULLA finished fifth to Gallant Oscar at Punchestown last May in a big field, and he ran well when seventh to Cause Of Causes in last season’s National Hunt Chase. He the most of a good opportunity but made fairly hard work of it in 3m Warwick novice chase last month. SHOTGUN PADDY easily beat Royale Knight in a Grade 3 at Warwick a couple of years ago and the fact that he is 20lb better off is testament to how well he is treated at present. Emma Lavelle's stayer, fitted with cheekpieces today, has been placed in both the Welsh National and Eider Chase this season and is readily forgiven his run on bottomless ground at Uttoxeter last time. PINEAU DE RE, 2014 Grand National winner, has been largely out of sorts since his famous success. He has only made the frame once over fences, which came when runner-up behind Vino Griego at Sandown, and his sole win since came over hurdles in December at Carlisle. He He didn’t show a great deal back over fences last month when a well-beaten seventh to Shotavodka in the Greatwood Veterans’ Chase at Newbury. SPOOKYDOOKY won at Newbury in November under Johnson and good fourth in Midlands National last month after mistakes while EMPEROR'S CHOICE, the 2014 Welsh National winner, landed Haydock handicap in the mud on return this season. He disappointed when seeking back-to-back wins at Chepstow last time. MASTERS HILL has been placed in his past three runs, most recently at Taunton a month ago where he was beaten a head by Goodtoknow. That was over three and a half miles on good to soft. He was giving the winner 5lb. He jumped slightly left but his show of stamina was encouraging, especially as he pulled up in the Welsh National in January on heavy ground. BEREAU BORU has been making hay at a lower level in recent months. He has stamina to prove, having yet to race, never mind win, beyond 3 miles over hurdles or fences and has done all his winning on heavy going. TOP WOOD has had a spin over hurdles since his fall at Cheltenham. He was going ok when coming down 4 out at the Festival and could go well. Other possible contenders are the useful ALVARADO, FINE RIGHTLY, GOODTOKNOW, MILANSBAR and TOUR DES CHAMPS. Very few chances for the outsiders STRAIDNAHANNA, SUN CLOUD, DOLATULO and GOLD FUTURES. "2016 Scottish Grand National predictions, betting tips, odds and free bets (Ayr - April 16, 2016)"